Of all the carbon emitters that surround us every day it’s easy to overlook one of the most ubiquitous: concrete. The material that builds our buildings, paves our roads and spans our bridges is the most widely produced and consumed material on earth apart from water, according to a WBCSD report. By 2030, urban growth in China and India will place global cement output at 5bn metric tons per year, with current output already responsible for 8% of the global emissions total, according to a WWF report. Although its environmental impact is far from benign, concrete – defined as the mixture of aggregates, water and the hydraulic powder material known as cement – is incredibly useful and widely applicable. Thanks to its durability, easily-sourced raw materials and thermal resistance, it is unlikely that an alternative building material will replace it on a large scale any time soon. Healing these cracks the old-fashioned way is no small expense. According to HealCON, the project working on the self-healing concrete, annual maintenance cost for bridges, tunnels and other essential infrastructure in the EU reaches €6bn (£4.2bn) a year. Encouraging as it sounds, Jonkers’ self-healing concrete can’t cure very wide cracks or potholes on roads just yet; the technology is currently able to mend cracks up to 0.8mm wide. And while making better concrete is a more feasible approach to sustainable building than shifting to an entirely new building material, that doesn’t mean the innovation is a sure bet. The current cost would be prohibitive for many. A standard-priced cubic meter of concrete is €70, according to Jonkers, while the self-healing variety would cost €100. John Alker, director of policy at the UK Green Building Council, says the success of any new green infrastructure technology relies on innovators like Jonkers being able to demonstrate the particular benefit of a product, whether that’s around cost or enabling a client to meet environmental targets. Though Jonkers is aware of the challenges of reaching wide adoption of the material, he points out that in particularly vulnerable environments – such as coastal communities or tropical regions that are increasingly experiencing extreme rainfall – some are already seeing the cost-benefit analysis of using this technology from the outset. The streets were paved with algae: a greener material? The process of surfacing a road isn’t complicated. Layers of asphalt, which is composed mostly of bitumen (a byproduct of crude oil distillation), are poured over an aggregate of crushed stone and sand; the asphalt acts as a glue, binding the mixture together to form asphalt concrete. Maintaining the roads, however, is a costly job. According to the Asphalt Industry Alliance it would cost more than £12bn to restore all road networks in England alone to a reasonable condition. Simon Hesp, a professor and chemical engineer at Queen’s University in Ontario, believes standard industry asphalt is not sustainable. “The problem with the composition is that it’s poorly controlled … it uses materials with poor performances,” he says. Hesp says the presence of certain oil residues lowers the quality of the concrete and is a key reason why roads are failing and many potholes need to be filled and cracks fixed. But there’s not just a maintenance cost. Asphalt, dependent as it is on the oil industry, is resource- and energy-intensive, which is why the race is on to develop a greener alternative. In Sydney an experiment is under way using printer toner waste blended with recycled oil to produce an environmentally friendly asphalt. And in the past few years there have been studies into the development of non-petroleum bioasphalts. At Washington State University researchers developed asphalt from cooking oil, and last year academics at Wageningen University in the Netherlands found that lignin – a natural substance found in plants and trees – is another suitable replacement for crude oil bitumen. Other investigations have looked into the use of soybean and canola oil (rapeseed oil) and coffee grounds. The WSU research, led by Haifang Wen and published at the end of 2013, concluded that the introduction of cooking oil can increase bioasphalt’s resistance to cracking . Wenn also claims it’s possible that, if commercialised, such bioasphalts could cost much less per tonne. The price of standard asphalt can fluctuate wildly as it’s dependent on the price of oil. Hesp isn’t convinced that cooking oil is the way forward. He says, like petroleum, over time it will cause roads to fail because of weak bonds. Bujoli recently played a key role in developing a bioasphalt from microalgae. It uses a process known as hydrothermal liquefaction, which is used to convert waste biomass, including wood and sewage, into biocrude oil. The chemical composition of the microalgae bioasphalt differs from petroleum-derived asphalt, but initial tests have concluded that it also bears similar viscous properties and can bind aggregates together efficiently, as well as being able to cope with loads such as vehicles. How it will perform over time is yet to be determined. The findings were published in April. Bujoli suggests that microalgae – also known for its use in the production of cosmetic and textile dyes – is a greener and more appropriate solution than agricultural oils. The latter, he says, should be kept for food production. “The benefits of microalgae over other sources include low competition for arable land, high per hectare biomass yields and large harvesting turnovers. There is also the opportunity to recycle wastewater and carbon dioxide as a way of contributing to sustainable development,” he adds. It’s a neat idea, with an admirable green mission behind it, but how much of an impact can it really have? Technology such as this is still in its infancy, suggests Heather Dylla, director of sustainable engineering at the National Asphalt Pavement Association, a US trade organisation for the paving industry. “A lot of interesting work is being done in this area, looking at everything from algae, to swine waste, to byproducts from paper making. It’s worth exploring these alternatives, but we need to be sure they provide equivalent or improved engineering properties. We need to understand how they affect the recyclability of asphalt pavement mixtures,” she says. Microalgae could yet put the paving industry on the road to a greener future. For now though, there are plenty of challenges – from price to scalability – for Bujoli and his team to address if the bioasphalt is to be commercialised. 1. What is a smart machine? It’s a cognitive, contextually aware computing system capable of making decisions without human intervention. Smart machines use machine learning and data catchments to perform work traditionally conducted by humans. They are supposed to boost efficiency and productivity, and are being pegged as a major component in building a sustainable future. But, like all burgeoning technologies, the limits of sustainability within this future are not yet clear. Much will be based on which smart technologies society adopts. What we do know is the smart tech revolution is the first industrial movement that holds sustainability at the forefront of its development, and that’s a good thing. Replacing manual services with smart tech is expected to significantly reduce energy consumption. But the energy required to develop, build, run and service smart technology products must be considered. This video about two men cutting grass demonstrates the redundancy of overcapitalising on technology and the dangers of manufacturing a dependancy on regressive technology. “While I believe, in general, that we’ll save energy by incorporating these machines into our lives, we have to be mindful that they themselves consume energy”, says Marshall Cox, founder and CEO of Radiator Labs. 4. Will smart technology make us stupid? The successful integration of smart technology will see the enhancement of creative thought. The workforce will need an increasing skill level as more and more mundane work is overtaken. There are concerns that through automation and algorithm technology, human development could be stunted and lulled into complacency. It’s important to be aware of this threat. That said, there were similar fears heading into the industrial revolution and we work harder now than ever. 5. They took our jobs! What are the implications of smart machines in work? Reducing the human workforce to subservient drones isn’t in anyone’s interest, but it’s unlikely that progress will spiral out of human control. The aspirational focus is for smart machines to enable us to be more productive and flexible. By using them we can make more efficient, sustainable use of our resources. “From a workforce point of view, smarter machines make us more productive and this allows us to focus on value-added activities”, says Maria Hernandez from Cisco Systems. Performance failure is raised as a frequent concern whenever smart tech is involved, especially when we are looking at self-driving vehicles and other sectors where human life could be directly affected by smart machines. There is an argument that the systems should be intelligent enough to work out areas of poor performance and correct themselves. But nothing is fail-proof and it would be naive to think smart tech will be. There will be bugs in the beginning, but hopefully the collateral eggs in this omelette are minimal. In the best-case scenario, we’ll combine smart technology with the agility of human decision-making to make sustainable and safe decisions. For example, says Chris Bilton, director of research and technology at BT, “The machine provides you with real-time information and you have the choice as to what action to take. This makes you think actively about your behaviours”. Hate it or love it, be prepared for smart technology to become a much bigger part of your life. It offers unbounded potential to improve our lives and enhance sustainability from all angles – home, health, manufacturing, work, transport, energy and leisure. But we also need to address issues such as IT security, skills and labour market problems. At the forefront we need to ensure that smart machines are enabling devices and not controlling mechanisms. “The intelligence needs to be implemented in a way that augments our creative thinking rather than replaces it, and we need to consider where those boundaries lie,” says Stephen Barker, head of energy and environmental care at Siemens. In the end, human capital must always remain dominant. “One might say that our humanity is found in what lies between a 1 and a 0,” says Jeff Wilson, dean of Huston-Tillotson University and “professor dumpster”. “That ‘in between’ is not within a machine’s capability. To me that ‘in between’ space will be ours”. Imagine living in a house that contributed to society: a house that produced energy, while consuming none itself. Well, imagine no more. After perfecting the “passivhaus”, which consumes minimal energy, engineers and architects have developed the energy positive house. Generating energy is one thing, building a house is another. But with its plant-decorated walls and enormous double-glazed windows, the ArchiBlox Positive House, introduced in Melbourne’s City Square last month, looks elegant and modernist. “The trick is to make the sustainable and performance products visually pleasing while also practical,” reports David Martin, construction director of the ArchiBlox Positive House – the world’s first pre-fab energy positive house. Rooftop solar panels and cooling tubes generate energy and regulate the temperature, while double-glazed windows and thick walls conserve energy. The end result: surplus power. The ArchiBlox team is not alone in successfully completing the energy positive challenge. The German city of Königsbrunn, working in collaboration with the Augsburg University of Applied Sciences and a local gas and electricity company, is finalising the cube-like Visioneum in the central square, where city officials hope its presence will inspire residents to think about their household energy consumption. 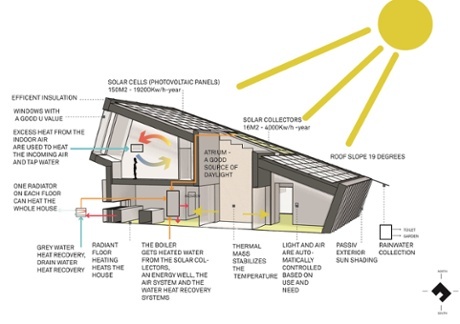 At the University of California, Berkeley, students working in collaboration with Honda have developed yet another concept, the Honda Smart Home, which looks more like a typical terraced house, but which generates surplus energy the same way as the ArchiBlox and the Visioneum: by radically conserving it while generating more than it needs though solar panels. Students at the Delft University of Technology, meanwhile, have invented a highly innovative “skin” that can be attached to existing houses with similar results. And in Norway, architecture firm Future Built has managed to turn two ordinary office buildings into energy-generating ones, cutting their energy use by 90% through additional insulation and the use of sensors to control light and heating. Here, too, solar panels on the roof provide energy that can be sold back to the grid. With cars and homes accounting for 44% of greenhouse gasses in United States (and similar percentages in Europe), it’s no surprise that researchers and architects are trying to find ways of making homes more energy-efficient. “The development of smart technologies, like the Google Nest, is making energy savings more convenient for users by allowing for control over temperatures in the house while you are away from the house, and allowing temperatures to follow your daily routines”, notes Esben Alslund-Lanthén, an analyst at the Danish sustainability thinktank Sustainia. Kristian Edwards says building a plus-house is technically straightforward. “We calculated how many square meters of solar panels we needed and optimised the angle of the roof to get maximum solar yield,” he reports. “But plus-houses are also about minimising energy consumption, so we used as much recycled material as possible, such as whole bricks from a barn nearby.” With its box-like wooden top floor slanted over the lower floor for maximum sun exposure, Snøhetta’s experiment – the ZEB Multi-Comfort House, located in the Norwegian city of Larvik – boasts a visually striking appearance. But Edwards, an architect at the Snøhetta architechture firm in Oslo, argues that plus-houses don’t have to be expensive, noting that a ZEB-style house may only cost 25% more to build than a similar, newly-designed home. The dropping cost of photovoltaic cells will also aid the advance of plus-houses. Either way, utility companies are currently developing new payment models that will allow home owners to pay back the cost of the new technologies through energy savings. Other plus-house owners may opt to sell their surplus energy to the grid. At the ZEB house, in turn, surplus energy will power the electric car that future residents may own. What’s life in a plus-house like? 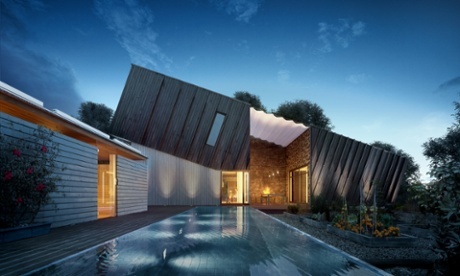 Norwegian families have volunteered to test the ZEB house for three months each and will report their findings to Edwards and his Snøhetta colleagues. And David Martin is about to find out for himself, having signed up to live in his ArchiBlox construction with his young family for the next 24 months.